Future materials in the field of thermoplastics require a lower impact on the environment. Actual thermoplastic materials also require “greener” additives for thermal and fire resistance profile. In this work, some of the recent solutions for halogen-free flame retardants were discussed in the context of viable routes with economical and industrial relevance. The fire retardant mechanism was discussed in order to imagine new solutions for future additives. Some of the main (inorganic, organic or hybrid) flame retardants can be used as common platform for the next classes of thermoplastic composites (synthetic, natural, or bio-based). The new generation of flame retardants (based on the emerging solutions) will have to surpass two major barriers: the cost effectiveness and the need for high concentration (which usually affects other properties). Flame retardant research for application in the field of polymer materials (either synthetic, bio-based or natural), is still an important direction nowadays . The materials of the future tend to become lighter and “bio-based” as much as possible, in order to achieve the perfect renewability of resources [1, 2, 3]. These novel materials will involve more and more the organic matter [4, 5, 6]. The organic matter content will consist, as much as possible, in polymer or polymer like structures, of either bio-based or synthetic origin. In both cases the macromolecular structures derived from condensation reactions will play an active role. This role derives from two main directions: (1) natural polymer materials are mainly condensation polymers and (2) both synthetic and natural condensation polymers are more susceptible to biodegradation, being more attractive for enzymatic processes. In this context future applications of such materials will require more and more “reliable” solutions for their fire behaviour. 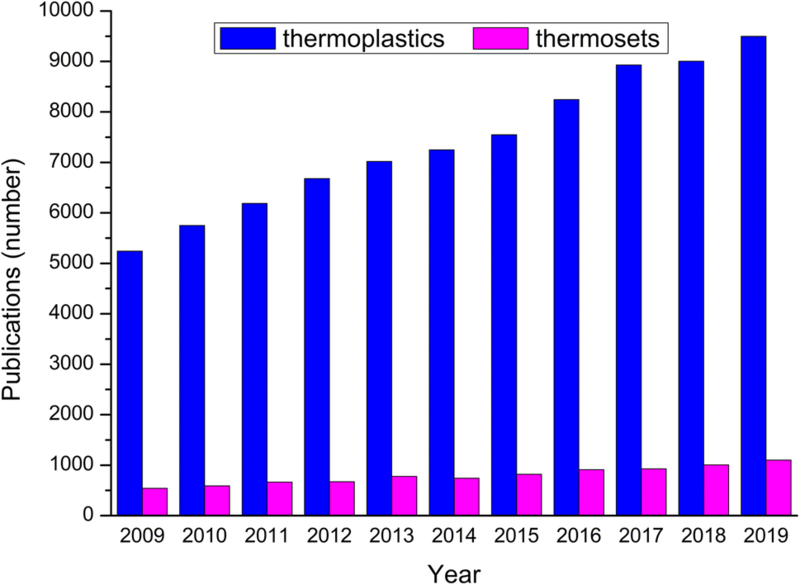 Amongst the two main classes of polymer materials, as far as their heating behaviour is concerned, namely thermoplastics and thermosets, the larger publishing interest expressed as number of papers released, was found for the first category (Fig. 1). The same major interest was registered for the flame retardant topic, in connection with the three main classes of thermoplastics based on condensation polymers, i.e. polyamides, polyesters and polyurethanes (Fig. 2). The numbers dynamic was reflected by ISI indexed and impact factor publications, like articles, conferences, letters, data papers, proceedings papers, editorial materials, reviews and books, book reviews, chapters or other similar materials. This large interest reflects on one hand the large application potential and on the other hand the recycling ability . Both directions require more intensive use and less ecological impact. In this context, the future materials are expected from now on, to be researched more and more within this region. Latest published research trends highlighted already the need for replacing several classical solutions. There are several directions to improve the fire behaviour of polymer materials. A flame retardant (FR), for example, can be used as a comonomer, which, through a chemical reaction, will generate a FR polymer directly from the synthesis  or by the chemical modification of the prepolymer . The FR additive can be also incorporated into the polymer matrix, through the melt processing method by generating physical interactions. This later route was proven to be a simple and efficient method that allows the processing of a wide range of polymers by either extrusion or injection moulding in order to achieve a higher fire performance [10, 11] at industrial level. However, some interesting attempts have also revealed the possibility of fire retardation by coating the polymeric surface with an intumescent layer [12, 13]. In order to develop an eligible additive formulation, three required agents must be put forth: the acid source, the carbonizing agent and the blowing agent. The acid donor leads to dehydration of the carbonizing agent that becomes a char, while the blowing agent is important because of the gaseous products it releases. Besides the basic characteristics of a flame retardant agent, an effective additive should also satisfy the following features: it should be inexpensive, affordable and moreover, compatible with the polymer it is loaded in, without drastically affecting other properties (for example, the mechanical properties). The main characteristics of halogen-free organic/inorganic flame retardants are illustrated in Fig. 3 . Nowadays, the industrial market has a wide range of FRs including minerals and halogen-, phosphorus- and nitrogen-containing compounds. Although the halogen-based FRs have been the most used over time, now the main problem is restricting their use. These FRs involve some negative environmental impact. Halogenated FRs usually act in the gaseous phase, releasing toxic and corrosive gases, which along with the black smoke make them dangerous for the environment and human health. Therefore, a tendency appeared for replacing these additives with halogen-free compounds (such as phosphorus/nitrogen FR—Fig. 4). Plastic compositions contain a large number of additives. FR are next to other additives (like processing ones—i.e. plasticizers, or antioxidant agents) very probable to be release by plastic matrices in the environment causing severe impact on food, animals and human health. One major example is the release of plastic chemicals from packaging materials when used in the microwave field . Bhunia et al. highlighted in several examples how residual monomers from packaging polymers and additives are prone to be released in food when subjected to microwave heating. Recent development of bio-plastic  reduced the risk of such events by several ways: the use of greener additives; the absences of such additives in some particular cases; the major classes of natural polymers do not contain residual monomers and the degradation products of the natural polymers are not so toxic. Several bio-plastics compositions can withstand the conditions of the microwave. Another major example of environmental and health problem for existing plastic material is represented by microplastic  contamination—therefore halogen based FR are a great threat and greener FR additives are strong needed in this context . The replacement of brominated FR is a major concern since the perspective of microplastic waste and pollution is a global problem with a wide localization [19, 20, 21]. Microplastic problem intrude little by little also the human body [22, 23], since several studies indicated the presence of microplastic (particles between 50 and 500 microns) in the human gut . This phenomenon appears to occur more often for the people consuming seashell food, however also the packaging sector still represents another important source of microplastic. It seems that bioaccumulation could be the highest threat with two major ways of body entrance (ingestion-from diet sources and inhalation-from environmental sources) . In this direction, a solution was developed by using bio-plastic materials  with biodegradable profile like starch or polysaccharide based. This class can be an alternative, since the degradation products are less likely to affect environment and health. These bio-plastic materials also request combinations with halogen-free FR . The thermoplastic condensation polymers have found applications in a variety of fields: from packaging up to the automotive industry, increasing more and more the interaction with humans and environment. However, some applications started to ask for higher and higher safety requirements, or even led to a restriction due to their ignition capacity. In this context numerous studies to improve the fire performance of this polymer class have been carried out. There are several important areas that require the use of flame retardants, including electronics and electrical devices , the transportation industry (cars, trains, and airplanes) , furnishings, building and construction materials . The increase of the transportation routes and volumes attracts also a higher fire risk, and therefore, the polymers used in building materials should be all flame retarded with halogen-free additives to reduce the release of smoke and delay the flame propagation for a few seconds. These seconds were proven critical in order to make a difference in the case of a conflagration or between life and death. Polyamide (PA) is a well-known thermoplastic with applications in various areas such as textile, automotive, electrical and construction. These applications were made possible by employing flame retardant polyamide, which untreated, can easily burn into the atmosphere with a melt dripping behaviour. Aliphatic polyamides are less fire resistant, with a LOI value around 21%, while the aromatic polyamides have higher stability. Polylactic acid (PLA) was often described as a biodegradable and biocompatible polymer obtained from renewable resource known for its medical performance or packaging applications. Although it was proven as a flammable polymer, like most thermoplastics, it has found several application in electrical and electronics fields . This has become possible after improving the fire resistance of the PLA, which, being a biodegradable polymer, required a halogen-free flame retardant. Another reason for using halogen free-flame retardants was the development of eco-friendly waterborne polyurethane  or solvent-free two-component polyurethane . The flame retardant mechanism involves the chemical and physical interaction of the additive with the polymer matrix where it was loaded in. Under the action of heat, the high temperature of the polymer causes changes in its viscosity, leading to the formation of burning droplets. At the same time, fragmentation of macromolecular chains is followed by the appearance of compounds with low molecular weight. The combustion is maintained by the gases resulting from polymer degradation, which ignites itself in the presence of oxygen. The main role of the additive is to inhibit flame propagation, as burning of the resulting gases increases the level of heat, and the fire becomes uncontrolled. It is important to increase also the time between ignition and flame propagation, as there are seconds in the overall process which very often could save lives. If, from chemical point of view, the additives inhibit radical formation, the physical action of FR could be described by three main effects. Firstly, the FR has the role of cooling the polymer structure. Examples in this regard are inorganic hydroxides, whose endothermic decomposition cools down the system . On the other hand, the FR decomposition may result in the formation of a protective char layer at the polymer surface which represents a barrier between oxygen and decomposition gases, thus reducing the heat and mass transfer. Another mode of action is the dilution of the combustion gases by releasing inert gases/vapours such as carbon dioxide, ammonia and water during the decomposition of the FR. There are several established methods to investigate the fire resistance of the polymeric materials. Scheme 1 illustrates some examples of the flammability standards applied to polymeric structures [34, 35]. Limiting oxygen index (LOI) was proven as the most common method to characterize the flammability of a material (e.g. plastic, textile, rubber) and represents a minimum oxygen concentration required to sustain combustion of a specimen for 3 min with a consumption of no more than 5 cm from the length of the sample . The test is performed in a glass chamber where the sample was clamped in a vertical position and ignited at the top by a gas flame (propane gas). An oxygen/nitrogen mixture is led into the chamber and its composition is changed during the measurement to determine the minimum oxygen concentration. As the oxygen concentration in the air is 21%, it is considered that the materials having LOI < 21% will easily support burning in the air. The specimens exhibiting LOI values in the range of 21–28% are classified as slow-burning, while those with LOI higher than 28% are considered self-extinguishing. Based on the resulting values, this method offers the possibility of comparison between the fire resistance of different materials and the examination of the efficiency of the loaded FR. Table 1 summarizes several LOI values for some condensation polymers. Although it cannot be anticipated under large-scale fire, the burning behaviour of the polymer material is usually estimated by UL-94 tests (Standard for Safety of Flammability of Plastic Materials for Parts in Devices and Appliances testing). This test was proven reliable for providing information about ignition, flame propagation and extinction. Usually the bar-shaped samples are used in vertical or horizontal position and depending on the burning time and dripping behaviour, the samples get a general classification: V0 (best), V1 (good), V2 (drips). Further development of the standard allowed a more precise assessment also for horizontal burn (HB-materials which are considered “self-extinguishing”), or surface burn (5VA burning stops within 60 s, with no burn-through; 5VB burning stops within 60 s, with a burn-through effect). The cone calorimeter test evolved as a bench-scale method that allows the determination of oxygen consumption during combustion of the material. The analysis takes place in a cone calorimeter apparatus, where the specimen is exposed to a certain heat flux. A spark igniter initiates the combustion of the gases released from the heated sample. The resulting data are used to determine the heat release rate (HRR)—an important parameter in flammability study which is proportional with the oxygen consumption. Furthermore, this test is performed in order to achieve some thermal and smoke parameters such as time to ignition (TTI), mass loss rate (MLR), total smoke released (TSR), carbon oxide and carbon dioxide yields . The resultant metal oxide forms a protective layer at the surface which has the role of oxygen and heat insulating barrier. ATH is used in various polymeric matrices, but a large amount is needed to get FR improvements. According to this, ATH was studied in combination with other additives in order to obtain a synergistic effect. Wang et al. synthesized a core–shell structure consisting of expandable graphite (EG) particles encapsulated with ATH for enhancing the fire behaviour of rigid polyurethane foams (RPUFs) . The LOI test illustrated that the addition of 11.5 wt% FR increased the value from 21.5 to 29.6%. As for cone calorimeter data, it was found that EG-ATH particles influence the TSR and carbon oxide production (COP) being suitable for flame retardancy of RPUFs. Several studies reported the efficiency of the synergistic combination between ATH and APP [44, 45, 46, 47]. Addition of APP and ATH into epoxy or unsaturated polyester resins reduces the value of combustion parameters, the samples becoming self-extinguishable at a concentration of 10 wt% ATH and 5 wt% APP . For polyisocyanurate-polyurethane foams, cone calorimeter tests showed that the pHRR decreased, while the LOI values jumped from 21.2 to 28.0% at a filler content of 5 wt% ATH and 15 wt% APP . The decomposition temperature of MH is higher by 100 °C than for ATH, and that is why MH is used as FR in polypropylene (PP) , PA  and PET . The endothermic degradation of MH results in the release of water that causes the hydrolysis of the polymer chains. The resulting compounds, mainly water, carbon dioxide and ammonia, have a beneficial effect in PA6 and PA66 fire retardancy, acting in both gaseous phase by dilution and condensed phase by forming a layer which prevents polyamide from further decomposition . In addition, MH was studied as FR for PA6/PP composites . It was found that MH protects the PA6/PP blends by forming a mineral crust during combustion. At a filler content greater than 30 wt%, the samples showed favourable results in LOI and UL-94 analyses. However, the crystallinity and impact strength of PA6/PP composites were negatively affected. Yang et al. investigated the efficiency of a novel FR system based on carbon microspheres coated (CMSs) by MH in improving fire behaviour of PET. It was shown that for PET loaded at only 1 wt% additive, a LOI of 27.5% and V-0 classification, were reached. Fire performance of PET with MH/CMSs was investigated by cone calorimeter test. The results suggested the decrease of the main characteristics: pHRR and MLS because of the cross-linking structure of char layer. The necessity for a flame-retardant unsaturated polyester resin (UPR) was due to the fact that during combustion, this compound produces a lot of toxic gases, heat and smoke. Therefore, MH was an example of FR studied for delaying the propagation of fire after UPR ignition . The evaluation of combustion performance illustrated that the FR properties of UPR were improved with increasing the additive concentration, the best fire behaviour being achieved at 55 wt% MH content. Zirconium phosphate (ZrP) is an inorganic compound that presents interest due to its specific properties: biocompatibility [55, 56], thermal stability, ion-exchange ability . These characteristics make possible the utilization of ZrP in catalysis , drug-delivery , photochemistry , anti-corrosion protection . From morphological point of view, ZrP can be found in both amorphous and crystalline form. The most utilized method in order to synthesize the amorphous phase is by sol–gel method from which particles of different shapes are formed: spheres, cubes, globules and irregular shapes. 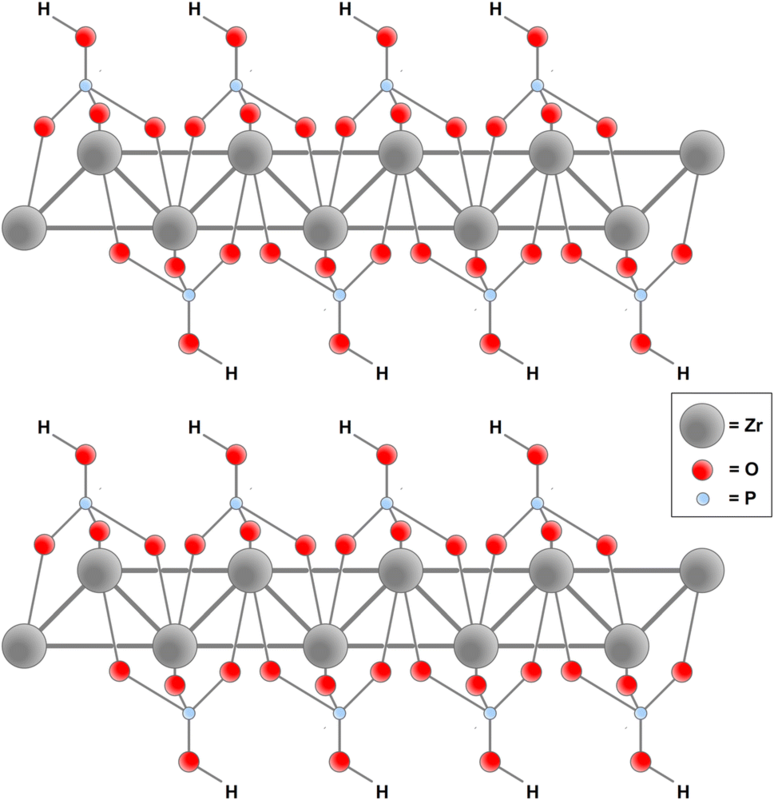 The crystalline ZrP consists of a two-dimensional layered structure, as illustrated in Fig. 5. Particularly for crystalline ZrP is the possibility to be exfoliated in a single layer and to achieve intercalation which allows in turn the modification of surfaces in order to obtain functional materials. ZrP was proven as an effective flame retardant for various polymer matrices because of its thermal stability up to 800 °C. ZrP acts as a flame retardant by forming a ceramic layer on the surface, inhibiting the transfer of the heat and mass. In addition, ZrP is involved in the catalytic degradation of the polymer by proton attack on the macromolecular chains. Several studies investigated the fire performance of condensation polymers using ZrP as flame retardant. In this respect, PA6 and PET were flame retarded with ZrP by a melting process . It was found that ZrP incorporated in PA6, reduces the HRR. In the case of flame-retarded PET, the flammability tests didn’t show an improvement in the fire behaviour, therefore a second phosphorus-based additive was used. As a result of the synergistic effect, the samples were classified into V-0 rating. It was reported by Xiang et al. that α-ZrP had a good synergistic effect with ammonium sulfamate (AS) in PA6 matrix. The mechanical properties, thermal stability and combustion behaviour were investigated. A dosage of 3 wt% α-ZrP and 2 wt% AS was enough to obtain a LOI value of 38.7%. As it can be seen, a larger amount of α-ZrP is used, because AS affects the mechanical properties of the polymer. All the specimens containing more than 1.5 wt% ZrP passed the UL-94 V-0 flammability rating. Xiao et al. synthesized a new flame retardant system made of melamine, cyanuric acid and α-ZrP. This additive was obtained by self-assembly of the three compounds and studied to reduce the flammability of PA6. When the concentration of α-ZrP-modified melamine cyanurate (MCA) was 10 wt%, an improvement in the combustion properties of PA6 was achieved: reduction of the HRR and THR, V-0 rank in UL-94 test and anti-dripping effects. It was found that a content of 30 wt% MCA-α-ZrP influences the crystallinity of PA6 inducing γ phase formation. Organo-modified or functionalized ZrP (OZrP or F-ZrP) were synthesized to improve fire behaviour of PLA systems [64, 65]. It was reported that PLA composites loaded with a small amount of OZrP (1wt%) showed some improved properties: low HRR and THR and a LOI value increased from 19.0 to 35.5%. In the case of F-ZrP, the initial decomposition temperature of the samples was slightly decreased, a V-0 rating was achieved and the LOI value was increased to 26.5%. 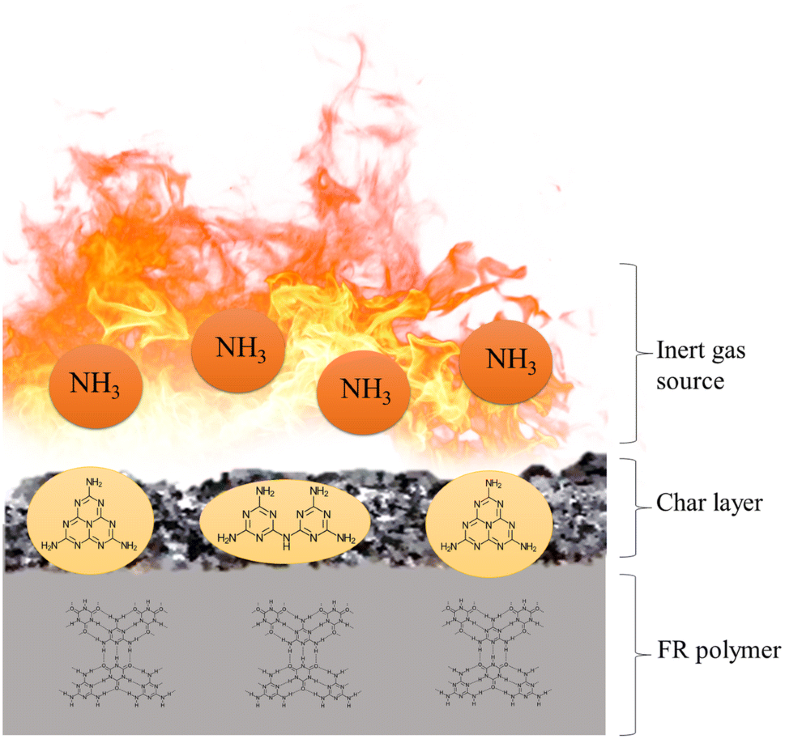 In both cases, it was found that the ZrP-based flame retardant contributes to the formation of a compact layer on the surface of char residue. In the same type of polyester, OZrP was used as a synergistic agent associated with polysulfonyldiphenylene phenyl phosphonate . This mixture allowed the PLA fibres to exhibit a better fire performance. The results showed a 20% reduction in HRR, a maximum LOI of 29.3% and a UL-94V-0 classification. Aluminium hypophosphite (AHP) is representative for phosphorus-containing flame retardants. This inorganic compound was examined in order to improve the thermal stability of condensation polymers. After the addition of AHP filler, glass-fibre-reinforced PA6 showed better fire behaviour . With increasing AHP content up to 25 wt%, the LOI results showed higher value: from 22.5 to 30.1%. It was found that AHP influences the combustion parameters of the composites. Therefore, pHRR, THR and TTI were significantly reduced. Regarding reinforced composites, preserving the mechanical properties after the additive loading was important. For this reason, 20 wt% AHP was the maximum concentration admitted. Compared to magnesium hypophosphite (MgHP), AHP has a better effect on improving the fire behaviour of PA6 . At an AHP content of 28%, the samples passed the V-0 classification with an LOI value of 26.8%, while at the same MgHP concentration the LOI reached only 23% and the V-2 rating. It was established that AHP determines an early thermal decomposition of the composite which in turn exhibits better mechanical properties than PA6 loaded with MgHP. Increased mechanical properties for the composite. Microencapsulated aluminium hypophosphite (MCAHP) was studied as FR for PA6. The thermal degradation study of MCAHP demonstrated MCA efficiency in improving thermal stability of AHP by increasing the decomposition temperature of AHP from 330 to 350 °C. Samples supplemented with MCAHP showed an increase in LOI from 21 to 27.5% and a shift in the UL-94 classification from no rating to V-0. A good flame retardancy of PA6 has been proven by a significant decrease in HRR and THR combustion parameters. Ammonium polyphosphate (APP) is a halogen-free flame retardant suitable for improving the fire performance of polyamides and polyurethane foam, as well as for polyolefins and epoxies. Moreover, it has a low cost and a good processability. The degree of polymerization influences the properties of APP and char formation of the composites that contain it . APP starts to decompose at 240 °C releasing ammonia and phosphoric acid with no additional amount of smoke, which makes this additive eco-friendly. Several studies demonstrated that APP combined with pentaerythritol (PER) enhance the fire properties of different polymeric formulations [71, 72, 73]. On the one hand, the addition of APP in PA6 matrix reduces the onset temperature of degradation by 100 °C. This phenomenon is explained by the catalytic effect of the phosphoric acid resulted from the APP decomposition. On the other hand, PER favours the cross-linking process, increasing the char yield . In bio-based PA1010, this intumescent formulation showed considerable changes in cone calorimeter analysis .Whereas the polymer matrix was obtained from natural sources, it was also investigated the partial replacement of PER with corn starch (ST). The results reveal that APP alone or in combination with PER or ST reduced pHRR up to 35%, but at the same time, increased the TSR. It was concluded that the three additives led to the formation of a thermally stable residue. The presence of APP generated a thin and dense layer, and the combination with PER or ST results in the formation of an expanded char. According to the main features of a FR, APP is an example of both acid source and blowing agent. Li et al. investigated the anti-dripping effect of a PA66 fabric by using APP, PER and melamine as FRs. In this regard, APP acts as an acid source, PER is a char source, while melamine is a blowing agent. To investigate this synergistic effect, thermal, mechanical and combustion analyses were carried out. The PA66 fabric treated with all three FR achieved a LOI value of 27.9% with no dripping tendency. As for the mechanical properties, the untreated sample of PA66 showed a tensile strength of 190.1 MPa. By loading the polymeric matrix with APP, PER and melamine, 89% of this value was retained. It was found that this FR system improves the dripping resistance by increasing the intumescent char layer. APP proved to be an effective additive for thermosetting materials like glass reinforced epoxy composites . The necessity of flame-retarding this composite is due to the fact that glass fibre acts as a candlewick, generating an accelerated degradation of the polymer. At an APP content of 5 wt%, the samples became self-extinguished, obtaining a V-0 rank in UL-94 tests. In terms of thermal and mechanical properties, APP does not induce significant changes due to its good distribution in the polymer matrix. Several studies have focused on the development of APP-based systems to reduce the flammability of polyurethane foams. Zhang et al. synthesized hydroxyl-functionalized APP (HAPP) via a cation exchange reaction in order to improve by chemical cross-linking the fire behaviour of a solvent-free two-component polyurethane. The results of LOI, UL-94 and cone calorimeter analyses suggested the effectiveness of the HAPP as FR, highlighted by the increased LOI value to 25.7%, V-1 classification and decreased pHRR, THR and TSP. The advantage of chemical incorporation of HAPP has been demonstrated by improving the tensile strength of the polymer matrix. Microencapsulation is a commonly used method to enhance the interfacial interaction between FR and the polymer matrix. In this regard, Shen et al. synthesized a core–shell structure of APP and 4,4′-oxydianiline-formaldehyde resin to be studied as FR in silanol-terminated polyurethane. This technique was proven as an effective strategy for improving the flame retardancy and compatibility of APP with bio-based polymers such as PLA and poly(butylene succinate) (PBS). Wang et al. reported the influence of microencapsulated APP (MCAPP) on fire behaviour of PLA/starch composites. It was found that a concentration of 20 wt% of MCAPP/ME and 5 wt% of starch increased the LOI value to 38%, samples obtaining a V-0 classification in UL-94 tests. The purpose of this study was also to limit the reaction between the acid source (MCAPP) and the carbonization agent (starch). In another research, APP was microencapsulated with thermally stable and hydrophobic ethyl cellulose to attain FR PBS composites . According to cone calorimeter analysis, the pHRR and TTI were significantly reduced when MCAPP and CFA were added into the polymer matrix. It was found that the mechanical properties remained unchanged if the MCAPP concentration does not exceed 15 wt% and that of CFA—5 wt%. Melamine and its derivatives proved excellent flame retardant properties because of the different modes of action. MCA has been used as a halogen-free flame inhibitor for polyamides, polyesters and polyurethanes because of its processing temperature around 300 °C. At a higher temperature, the degradation of melamine and cyanuric acid begins with consequent formation of water, ammonia and carbon dioxide. The structure of MCA consists in a 2D network of hydrogen bonds established between melamine and cyanuric acid, which increase the thermal stability and reduce the volatility of the MCA, making it a suitable flame retardant for polymer composites. Several studies were focused on MCA incorporation in polyamides to limit their flammability. Lu et al. prepared MCA/PA66 composites by melt-mixing technique and investigated their thermal and mechanical behaviour. A concentration of 10 wt% MCA was enough to achieve acceptable performance in flame retardancy, resulting a LOI of 33%. The thermal stability of the samples decreased as a result of MCA incorporation into the PA matrix, while the crystallization temperature was increased. This was a consequence of the strong hydrogen bond interaction between the both components. As for the mechanical properties, the strength and the toughness of PA composites with 10% filler content were improved. In another study, partial replacement of MCA with modified-layered silicate (MLS) was attempted . In this case, MCA was intercalated in layered silicates. Samples obtained by mixing and kneading PA66 with MLS and MCA in 93/3/4 ratio passed the UL-94 V-0 flammability rating and showed high mechanical properties. In the same way, the effect of the MCA mixture with carbon nanotubes (CNTs) and carbon black (CB) in PA6 was investigated by Šehić et al. . A better reinforcing effect, thermal and combustion behaviour were obtained for PA6 composites fibres supplemented with MCA and CB. MCA particles can present themselves under two dimensions: micro and nanometre-size. Geometries for micrometre-sized MCA particles can be sphere-like or rod-like, while nanometre-sized MCA particles can adopt a flake-like geometry. Tang et al. investigated the influence of these morphologies on PA6 fire behaviour. The results of LOI and UL-94 tests suggested that nanometre-size flake-like MCA had a better effect on inhibiting PA6 flammability. Furthermore, it has been found that by reducing the size of the MCA particles, their decomposition temperature increases due to the strong hydrogen bonds they form with the polyamide. There is the possibility to modify the internal hydrogen bond network formed between melamine and cyanuric acid. An example in this regard is the synthesis of MCA in the presence of nitrogenous bases such as: adenine, guanine, cytosine and uracil . The resulting compounds were used to limit the flammability of PA6 composites. The PA6/cytosine-MCA sample displayed a LOI value of 30.7% and UL-94 V-0 rating, compared to PA6 examples containing other bases that showed a V-2 rating. These results are explained by the fact that the cytosine-MCA particles are of smaller size, thus ensuring a better interaction with the polymer matrix. MCA acts both forms: in the gaseous phase, being a source of inert gas as well as in the condensed phase by forming a fire barrier that protects the polymer during combustion (Fig. 6). There are several studies that have investigated the mechanisms of PA degradation [86, 87, 88]. On the one hand, PA 6 can be degraded by oxidative way, resulting caprolactam and cyclopentanone as the main products. On the other hand, the degradation is caused by weak bond-breakage on molecular chains which leads to incomplete depolymerization. In this case, oligomers with high-boiling point are obtained. It was shown, that MCA improves PA6 condensed phase because of the self-condensation of the resulting oligomers producing a stable cross-linking structure . Yang et al. tested the flame retardant mixture of MCA and AHP to improve the fire performance of PET/GF composites. The synergistic effect of MC with AHP was observed, which was argued by the fact that AHP acted as a flame inhibitor in the condensed phase, while MCA had a diluting effect in the gas-phase. As a result, the specimens showed a reduction of heat release capacity (HRC) by 47%, an increase of LOI value by 31% and obtained a V-0 classification in UL-94 test. The combustion analysis showed that PET/GF composites formed a compact char that acted as an insulating barrier to oxygen and heat. MCA proved to be effective also in reducing the flammability of polyurethane foams (PUFs). It was established that the samples displayed a better fire behaviour caused by the inclusion and increase of additives concentration . Despite all of these, FR affects the mechanical properties and density of PUFs which is important for future applications of the polymer. Flexible PUFs are highly flammable, showing a LOI value of 18%. Rao et al. synthesized a novel melamine salt based on melamine and diphenylphosphinic acid that, incorporated in a flexible polyurethane matrix, acted as an efficient flame retardant. At a filler content of 30 phr, samples provided a LOI value of 25% and V-0 rank in UL-94 vertical burning test. Organophosphorus additives based on 9,10-dihydro-9-oxa-10-phosphaphenanthrene-10-oxide (DOPO) were reported as suitable FR for reducing the flammability of epoxy resins [92, 93, 94, 95] and polyurethane foams . DOPO-based FRs are used successfully to improve fire behaviour of polyamide  and polyester [98, 99]. Compared to conventional FRs, a lower amount of DOPO derivatives is required to obtain good performance in polymer flame retardancy . These compounds have FR effect mainly in the gas phase, releasing PO radicals. There are some studies on PA fire inhibition using DOPO derivatives. Bridged DOPO compounds were synthesized to be studied as FR for PA6: 6-((6-oxidibenzo[c,e][1,2]oxaphosphinin-6-yl)methoxy)dibenzo[c,e][1,2]oxaphosphinine 6-oxide) (DiDopoMeO) and 6,60-(ethane-1,2-diylbis(azanediyl))bis(6H-dibenzo[c,e][1,2]oxaphosphinine 6-oxide) (DiDopoEDA) . Flammability properties of these compounds were investigated compared to an usual P-content FR: aluminium diethylphosphinate (Exolit OP 1230). The results revealed that both DOPO derivatives improved LOI of 27.1% for neat PA6 to 31.7% for DiDopoEDA/PA6 composites, achieving a V-0 rating in UL-94tests. As well as conventional FRs, bridged DOPO derivatives determine the formation of an insulating layer on the surface. The presence of bubbles demonstrates that DOPO acts mainly in the gas phase. As for GFPA6T, a novel bridged DOPO-derivative (PN-DOPO) were synthesized . The fire behaviour of these samples was analysed in comparison to GFPA6T blended with OP 1230. At 15 wt% PN-DOPO content, the LOI was 28.9%, much lower as compared to the value given by the OP1230 additive but was improved as compared to neat GFPA6T. Cone calorimetric analysis illustrated the influence of PN-DOPO on HRR, THR and average CO2 yield by decreasing their values. Thermal analysis showed that by adding of DOPO, the degradation temperature of the composite decreases due to the earlier decomposition of the additive. Li et al. studied the FR mechanism of DOPO-SiO2 and a phosphorus-nitrogen based additive incorporated in PA6 matrix. This system was chosen in order to act in both gaseous and condensed phase. It was found that this combination influences the flammability of the polymer by increasing the char stability. The LOI attained 31% and the char residue increased to 11.6% when DOPO-SiO2 and OP1314 were used. In the PA66 copolymer, DOPO-SiO2 precursor decreased the pHRR by 33%, while the effective heat of combustion (EHC) was reduced by 18% . The chain extension with a DOPO-based diepoxide compound (DEP) is another method to enhance FR properties of PA6 . The polymer loaded with 2 wt% DEP and 10 wt% MCA passed the UL-94 test obtaining a V-0 classification, while the LOI jumped from 22.0 to 32.3%. No dripping was observed. By combining DOPO derivatives with conventional phosphorous-nitrogen additives, a highly efficient FR system is obtained. Hypophosphites produce radicals as PO·, PO2·, P2O4· which have the role of FR inhibitors in the gaseous phase. Furthermore, the volatile gases are diluted by N2, NH3 and H2O released by the nitrogen-based FR. In condensed phase, the resulting char layer acts as an oxygen and heat barrier. 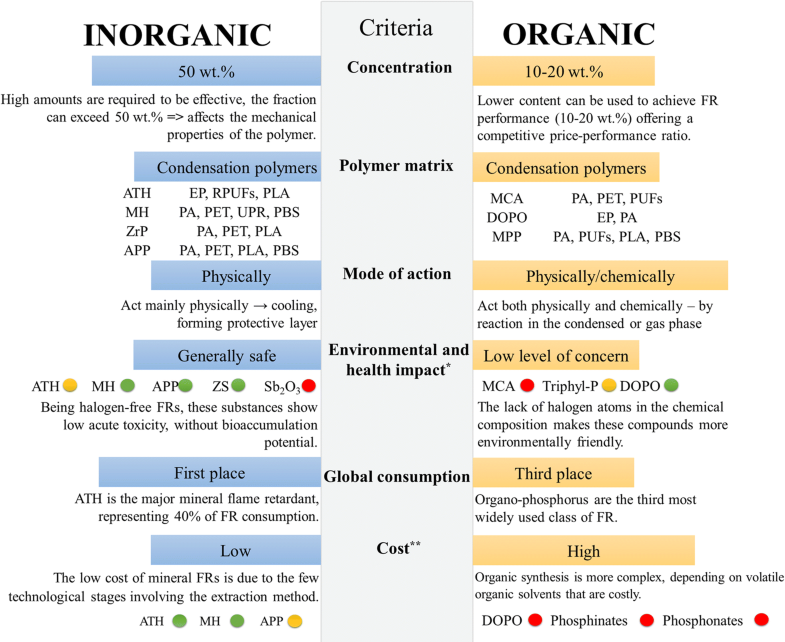 In order to obtain a global and comparative perspective between organic and inorganic flame retardants, previously discussed researches were structured in Tables 2 and 3. Phosphorus-based flame retardants, used in different forms such as: phosphates, phosphonates, phosphinates, are popular in this field because they can replace halogen-containing additives. Clariant Company patented FRs based on alkyl-substituted phosphinates, known as Exolit OP. Aluminium salts of diethylphosphinate were reported as the most widespread example of organic phosphinate, identified as OP 1230, OP 1240, OP 1311, OP 1312. They were developed as general purpose FR systems, being studied for polyamides and polyurethane foam  fire retardancy. Batistella et al. investigated the flame retardancy of PA11 using Exolit OP 1311 as additive. Cone calorimeter analysis showed that the incorporation of 20 wt% FR additive in PA11 led to a significant decrease of pHRR (about 50%). The authors studied the partial replacement of the OP additive with another more available compound with comparable properties. In this case, kaolinite was chosen for its interaction with OP 1311 leading to the formation of new crystalline phases during combustion. Using OP 1311/kaolinite (50:50) blends, the residue showed a higher phosphorus content, which demonstrates the capture of phosphorus compounds by kaolinite. Additives may be chosen depending on the synergistic effect they have on the filler used. The usual fillers incorporated in polyamides are GF, nanoclays (NC) such as MMT and HNTs, CNTs and CNF. About 5 wt% of NPs was enough to improve the flame retardancy of PA11 and reduce the amount of FR in the nanocomposites to 20% . Lao et al. studied the flammability of PA-NC and PA-CNF with intumescent FR additive nanocomposites. In their study, three Exolit OP grades with different amounts of phosphorus content were used (OP 1311, OP 1312 and OP 1230). The decomposition temperature for 50% mass loss (T50 %) had a significant increase because of the synergistic effect of the two additives: phosphorus-based FR and nanofillers. It was reported that OP 1312 provided the best synergistic effect to NC, while CNF is compatible with OP 1230 [108, 109]. A proportion of 20% OP was enough to achieve the V-0 rating. In the same type of polyamide, but containing HNTs and OP1312, an improvement in mechanical, thermal and flame retarding properties has been observed by using a minimum concentration of 25% FR and 2.5% NPs . By modifying the alkyl structure of the phosphinates, different fire retarding effects can be obtained on the polymer they are loaded in. Therefore, a novel salt of phosphinic acid was studied for enhancing the fire behaviour of many polymers. The aluminium salt of diisobutylphosphinic acid (ABPA) was synthesized to enhance the flame retardancy of PA6 composites. It works as a flame inhibitor in the gas phase during fire, having a minor effect in condensed phase. For PA6 combined with modified layered silicates like organo-modified montmorillonite (OMMT), the results showed an increase for the LOI of 21.0% for PA6/OMMT6% samples to 36.0% for PA6/OMMT2%/ABPA10% . As for PA6/GF composites, the synergy between ABPA and monoisobutylphosphinic acid was demonstrated by the reduced pHRR (288 kW/m2), increased LOI value (34.0%) and V-0 classification in the UL-94 test . Wang et al. investigated the FR properties of an epoxy resin containing aluminium poly-hexamethylenephosphinate (APHP). The combustion analysis showed that APHP acted both in gas and condensed phaseby decreasing the pHRR, THR and EHC values. During combustion, APHP releases aluminium phosphate and alkylphosphinic structures, which lead to the formation of a reinforced insulation barrier by interacting with polymer fragments. In gaseous phase, the resultant PO and PO2 acted as fire inhibitors. It was found that 4 wt% APHP was sufficient to achieve a V-1 rating in UL-94 test and a LOI value of 32.7%. Melamine was used in combinations with P-based compounds to obtain a synergistic effect that will increase the properties of the resultant additive. An example like melamine polyphosphate (MPP) was reported as an environmentally friendly flame retardant characterized by high thermal stability. In this compound the phosphate is an acid source while melamine acts as a blowing agent. During burning, the dehydrating action of the phosphate and the gases resulted by the degradation of the melamine influence the formation of the char layer. As well as other melamine derivatives, MPP has been successfully used to limit the flammability of polyamides. Liu et al. investigated the improvement of PA6 fire behaviour by adding MPP as flame retardant additive. PA6 was filled with silica fillers such as: fibrous wollastonite, talc and spherical glass bead. It was found that the geometric shape of the filler influenced the mechanical and combustion properties of PA6. Regarding UL-94 and LOI test, all three filled systems achieved a V-0 rating and LOI value > 33%. Wollastonite had also a reinforcement effect both in polyamide and charred layer. MPP can be used in synergistic combination with layered silicates as montmorillonite to increase the barrier properties of the char layer resulting in the intumescent process. It was shown that the co-addition of these compounds in PA6 increased the mechanical properties and improved the flame retardancy up to V-2 rating in UL-94 tests . Regarding glass fibre reinforced PA66, MPP needed to be incorporated by approximately 25 wt% to obtain a positive effect on the fire behaviour: 38% LOI value and UL-94 V-0 classification . The combination of several additives among them is a method to improve the fire behaviour of polymers. The resulting mixture exhibit a synergistic effect that increase fire retardant properties. Figure 7 shows the possible synergistic combinations of the usual FRs reported in the literature. An example in this direction is MPP that acts as a synergist with aluminium phosphinate (AlPi). A protection mechanism of this mixture in PA6 was studied . It was found that PA6/MPP-AlPi composites form during burning of a black charred bubble on the surface that acts as a gas filter. In this case, the main insulation is provided by the ceramic layer that appears under the bubble. The same type of layer was identified in samples of PA6/MPP-AlPi with MMT content, but this time it showed a covering crust instead of the bubble. The crust acted as a gas barrier because of its composition: char, aluminophosphates, phosphinates and degraded polyamide. As for burning tests, cone calorimeter, LOI and UL-94 vertical tests were carried out. When 2% of the flame retardant mixture was replaced with OMMT, the samples showed the following performance: a V-0 classification in UL-94 tests, the LOI was increased to 32%, while the pHRR was decreased by 75% . Melamine poly(metalphosphate), under the commercial name Safire, belongs to a halogen-free flame retardant class which is considered an “enhanced version” of MPP. 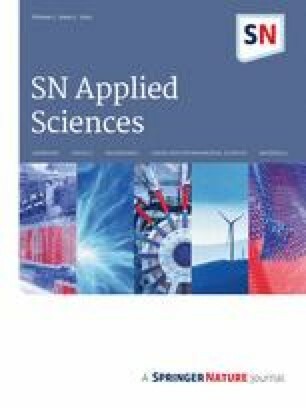 Melamine poly(zincphosphate) and its aluminium and magnesium analogues were studied as synergistic agents associated with AlPi in glass fibre-reinforced PA66. The mechanism of action in flame retardancy was reported by Naik et al. . The authors disclosed the possible degradation pathway, relying on the chemical species they identified in both condensed and gas phases. A dosage of 15 wt% synergistic blends was sufficient to attain V-0 rating in UL-94 protocol and to enhance the cone calorimeter parameters: HRR and THR . Flame retardants as seen for the last 10 years and as foreseen for the next future will still represent a very active topic. This was reflected by a large number of publications and correlated with the thermoplastic applications which will request in the near future even more intensive research. 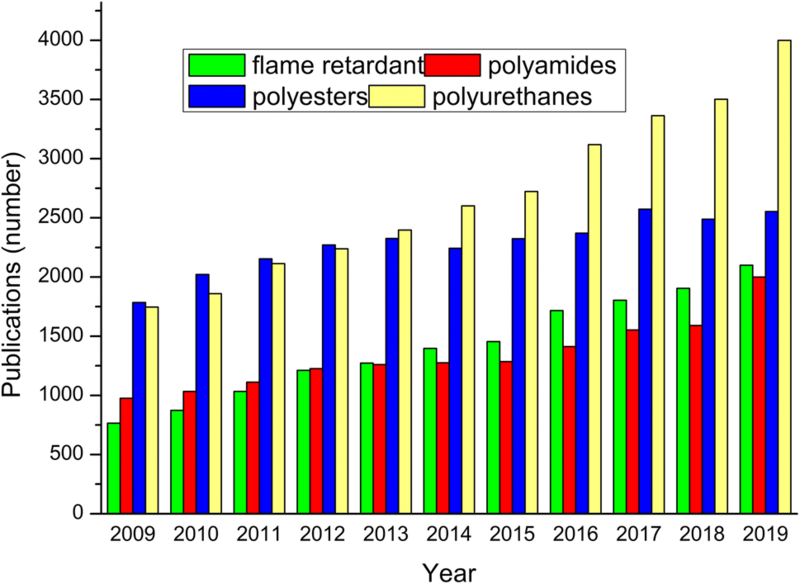 The flame retardants interaction with the environment was reported as the second most influential from all polymer additives after that of plasticizers. The presented data highlighted the alternatives to halogen FR, but with concrete application in an industrial perspective for a real replacement of some classical FR (with proven environmental and health severe problems). The relationship between flame retardants and thermoplastics (especially with condensation polymer matrices, which are more prone to be degraded also in bio-processes) will evolve more and will ask for new solutions, more eco-friendly, less toxic in contact with humans, safer in critical condition (emissions of toxic gases during a fire situation). Halogen-free flame retardants will remain a priority for the next few years at least. Halogen-based flame retardants are still very cost effective compared to the others. In industrial applications they will still exist as long as other robust solutions will not appear. One of the most researched classes of halogen-free flame retardants consists in the phosphorous based agents. Among the organic flame retardants based on phosphorous, DOPO-derivatives play an important role. They are effective and versatile for the application in the polymer matrix; however, there are a lot of them already proven for their potential toxic risk. Clay particles could play in the future a more important role, but more effective results are needed. In the same class, more advances are expected also for “greener” organo-modification agents available for clay. Future perspectives of “greener” FR are tough and bright as well (like a craving “sunrise”). The tough perspective consists in two main problems: -classical FR solutions provide high performances compared with “green” FR (therefore for the new solution will be difficult to compete with, i.e. efficiency, costs); -some actual halogen free FR are not yet proven as dangerous as halogen ones. Some of the “green” and very particular FR like nucleic acids (deoxyribonucleic acid)  were proven as interesting solutions for polyester fabrics, but their cost and production, makes them quite a mysterious route. However, the “sunrise” will come since large classes of proteins and amino acids were not intensively and in a sustainable manner researched. For examples some emerging direction based on phospho-proteins (like casein) could offer in the future some more realistic ways for animal-source bio-based FR . However, few results were exploited in synthetic and bio-based condensation polymer thermoplastics. Another hope for future directions is the combination of more accessible bio-based and biodegradable solutions with new classes of eco-friendly clay minerals. By this approach a potential cycle closing would be possible for the future fast bio-regenerating materials (with no waste on medium and long term). A potential future example of such smart bio-material, would be novel layered double hydroxides (LDH) for recovering phosphorous-based derivatives (from fresh waters areas i.e. affected by Eutrophication) and then used for FR applications (in new eco-friendly biodegradable materials) . This potential FR class of modified LDH in polymer materials, when entering the end-of-life stage, can offer controlled release in soil to re-establish the environmental equilibrium . We did not discuss LDH here since their power of action is driven also either by the metal hydroxyl content or by modifiers like phosphorous based compounds. Some other examples for future FR, should not exclude classes like keratin, chitosan, new phosphor-based proteins or new classes of amino acids, modified clay particles with amino acids or amino acid sequences isolated from plants. FR will play an important role in the future materials research,: the contact with materials, the consumption of materials and the environmental interface. This work was supported by a grant of the Romanian Ministry of Research and Innovation, CCCDI - UEFISCDI, project number PN-III-P1-1.2-PCCDI-2017-0387/80PCCDI Emerging technologies for the industrial application of 2D structures (graphene and non-graphene) Acronym EMERG2Ind, within PNCDIIII. This study was funded by 80PCCDI/2018.